Thank you so much for the invitation to address you this afternoon. I am very pleased to be included in this wonderful celebration. I know we are gathering today with very heavy hearts. I was out of town last month during the unspeakable tragedy in Chapel Hill and was unable to be with you during the vigils and funeral for Deah, Yusor and Razan. As a professor of young students, as a resident of Chapel Hill, and a father of three daughters, just thinking about the loss you have suffered fills me with great sadness. Before I begin my prepared remarks for today, I just want to say to you this afternoon that I am sorry. I am totally comfortable saying I am sorry even though I had absolutely no responsibility for what happened. But still I am sorry. I am sorry that we live in a country where anyone can buy, possess and brandish a deadly firearm – virtually no questions asked. I am sorry that when mentally ill Muslims act violently they are assumed to be al Qaeda terrorists, but when a non-Muslim commits a brutal, execution style murder, he is immediately labeled just an angry individual. And mostly, I am sorry that we have lost three such beautiful people – who made the world a better place and made their community so proud. May their memory forever be a blessing. I’ve been asked to speak today about Islamaphobia in America. I’d like to start out my talk by saying that I am not a big fan of the term Islamaphobia. Let me tell you why. I think the term Islamaphobia lets Americans off way too easy. Many, many Americans are fearful of Islam and they don’t think there is anything wrong with that. First off, every public opinion poll shows that Americans know very little about Islam and most of them do not have a friend or even an acquaintance who is a Muslim. It is very easy to fear something you know very little about. Second, one thing Americans do know about Islam is that the vast majority of people living in the Middle East are Muslims. And when Americans look at the Middle East, they do not like what they see. They do not like seeing Iranians chanting “Death to America,” they do not like to see persecution against Christians, they do not like the violence and brutality of the extremists, and they do not like the subjugation of women that they see abroad in many Muslim-majority countries. Now, you know and I know that the chaotic situation in the Middle East has everything to do with politics, history, culture and power and very little to do with Islam. Most Americans don’t know that and so when they see violence and turmoil in the Middle East – it makes them afraid of Islam. But I think that what Muslims in America are experiencing today, and have been experiencing both before and since 9/11, is more than the mere backlash from fear of Islam. It is deeper and more pernicious. First, there is the official discrimination at the airports and at the borders that is so pervasive that it cannot be denied with a straight face. How is it that we trust Muslim doctors to perform complex surgery in our hospitals but then when they travel three miles to the airport that same day they are automatically turned into objects of suspicion and distrust? This is blatantly wrong and should not continue in America in 2015.
where there is a total absence of any effort to show the suffering, the decency, and the humanity of Muslims here in the United States and around the globe. And then there is the American media that has utterly failed in its duty to explain to the American public what the true sources of al Qaeda and ISIS terrorism are. Instead, the media has lazily labeled this phenomenon as “Islamic terrorism” and thereby connected and tarnished the religion followed by 1.2 billion people around the globe with the actions of probably less than 1/1000th of a percent of the Muslims in the world today. Finally, we have the highly funded cottage industry of haters who spend their professional lives attempting to convince the American people that Muslims around the world, including here in America, are a deep threat. These haters claim that Muslims are a threat because they are violent, they seek and will obtain excessive political power, and because they want to impose a barbaric way of life on the United States and the American people. But these individuals have no facts to support any of their claims. The fact is, as I have documented with my colleague Charles Kurzman at UNC, that acts of terrorism by Muslim Americans are extremely rare. In the 13 ½ years since 9/11, there have been 50 fatalities in the United States attributable to acts of terrorist violence. This is 50 too many in my view, but it is very important to place this in context. During this same period, there have been 200,000 murders in the United States. If this weekend is like an average weekend – there will be about 50 homicides in the US – the same number of victims of terrorism by Muslim Americans in over 13 years. And by the way – people were 6 times more likely to be struck by lightning in 2014 than to be killed by a Muslim American terrorist. 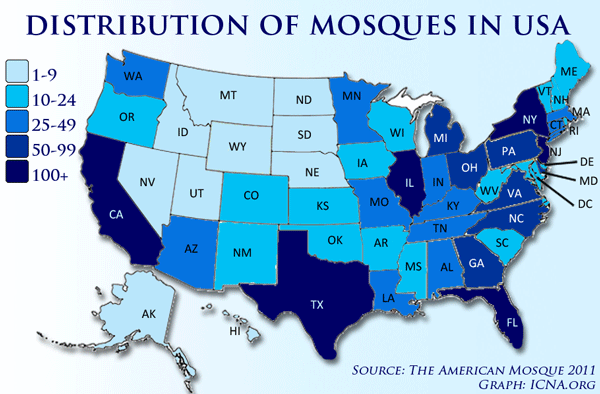 These facts, however, do not penetrate the media, they do not impact the entertainment industry, and they most certainly are ignored by the grass roots organizations that have as their sole purpose to spread falsehoods about Islam in America. The combination of these powerful influences have had a dramatic effect on much of the American public. It has stimulated, solidified, and engrained more than just fear of Islam, but actual hate and loathing of Islam, of Muslims, and all things Islamic. This, my friends, is not mere Islamaphobia, but anti-Islamic bigotry. And we ought to call this terrible phenomena by its name – bigotry – because that it what it is – plain and simple. It is high time that this form of bigotry takes its rightful place next to anti-African American bigotry which we call racism, and anti-Jewish bigotry that we call anti-Semitism, and anti-women bigotry that we call sexism – all of which are unacceptable in modern discourse. So what are we to do about this anti-Muslim bigotry that is proliferating, that is shaming our country, making the lives of Muslim Americans more difficult and less enjoyable, and, I believe, making the United States less safe? I am hardly an expert in how to cure a society of bigotry, but I have a few suggestions. I really believe that this problem has to be addressed from the bottom up, not from the top down. That is how you build political support that can push change, first locally, and then at national levels of our government, and then against the elements of society that are most resistant to change. So I would let the national organizations that defend Muslim civil rights to worry about Fox News, and Hollywood, and the Texas Legislature. Here, you should focus on your neighbors, your schools, and especially the youth of our community. It is great that you have opened your beautiful mosque today to the community, but that is not enough. You need to reach out to your neighbors, get to know them. Don’t be the mysterious Muslim that lives down the street. Open your home during your festivals. Talk to your neighbors at the bus stop in the morning. Your goal is not really to teach them about Islam – although that is fine. Your goal needs to be to get them to know you as a human being, as a North Carolinian, and an American. And once they know you and like you – that will teach them everything then need to know about what Islam is and what it is not. I also believe that if we want to fight bigotry, Muslims need to be fully engaged in a range of community activities. It is not enough to get to know your neighbor or your co-workers. People need to see you at PTA meetings, at youth soccer, at the community street fairs. Don’t speak out only about issues of concerns to Muslims – be a voice on issue like school budgets, or air pollution, or building parks or whatever you care about. Again, once people see you are just like them – these other things will take care of themselves. I think that when you are attacked, there is a temptation to be insular. If our children are chastised at school, let’s build our own schools. If women are stared at in the local gym because they dress modestly, let’s build our own gyms. I would suggest resisting that temptation. There is a beautiful Jewish Community Center right next to my temple in Durham but I am not a member. I do not want to live in a world where Jews only swim with Jews, and African Americans only swim with African Americans and so on. My last suggestion is that you have faith. Not the faith that you practice here in this mosque. But faith in America. You know, when people talk about immigrants in America, we like to talk about the paradigm of the American dream. This is the idea that America is open to everyone that is willing to work hard and play by the rules. And if you do, you will succeed economically, you will be accepted, and you will become an American. Now we all know that the reality for immigrants to America has been much different. There are elements of truth to the American dream, but also elements of myth. The truth is that every immigrant group that has come to these shores – the Irish, the Italians, the Germans, the Japanese and Chinese, the Mexicans and Latinos, and people from all over the globe – they have had to struggle to fit in and to be accepted. The immigrant experience is a hard one. There has been bigotry and discrimination. There has been violence. There have been tears and there has been pain. But over time these things subside, there is acceptance, there is peace. The other part of the myth is that our immigrants become “Americanized.” This too is only partially true. Sure, the children of immigrants, and their children’s children speak English better and take on more typically American customs than the prior generation. But America changes as well from this experience of infusion of new ideas, new foods, new languages, and new cultures. We benefit from the energy that immigrants bring. Their commitment to the ideals of justice and freedom actually strengthens our resolve to be the beacon that the myth of the American dream talks about. This is the great thing about America that makes us a great country and different, in my view, from any other place in the world. We are more adaptable, more open to change, more accepting than other countries. America is always trying to improve itself, to make our country better, and to help improve the world. We will keep trying until we do so. So, my friends, when I say, have faith, I mean to have faith in this idea that America will perfect itself. We will recognize that what is happening to Muslim Americans in these decades after 9/11 is wrong, unjust, and patently un-American. We will do better. Muslim Americans will take their rightful place as a part of the American tapestry as those that have come before have done in due course. Change will not come fast enough. Solutions will be partial and flawed. But I do have faith and I hope you do too. Dr. King famously said that “the arc of the universe is long, but ends in justice.” So I hope that as you endure the trials and travails, hardship and heartache, but also happiness and wonder, you will keep this mind. Yes the arc is long, but I do believe it will end in justice. Thank you so much for the honor of speaking with you this afternoon. Duke professor David Schanzer shared with ISLAMiCommentary his prepared remarks to the Islamic Association of Raleigh (NC) this weekend during their annual open house “Welcome to my Mosque. ” The open house was presented as “an opportunity for friends and neighbors from other faiths to know about Islam.” Schanzer was invited to speak on Islamophobia. About 200 people were in attendance. David H. Schanzer is an Associate Professor of the Practice at the Duke Sanford School of Public Policy and the Director of the Triangle Center on Terrorism and Homeland Security. He teaches courses on counterterrorism strategy, counterterrorism law and homeland security at Duke. Prior to his academic appointments, he was the Democratic staff director for the House of Representatives Committee on Homeland Security from 2003 to 2005. His positions in the executive branch include special counsel, Office of General Counsel, Department of Defense (1998-2001) and trial attorney, U.S. Department of Justice (1992-1994). Schanzer is also core faculty with the Duke Islamic Studies Center and a regular contributor to ISLAMiCommentary.